Inspired by Flouzen’s hand-knit cashmere ties, Kitsune Creative Director Masaya Kuroki immediately saw a common thread for collaboration: a desire for timeless and qualitative pieces. 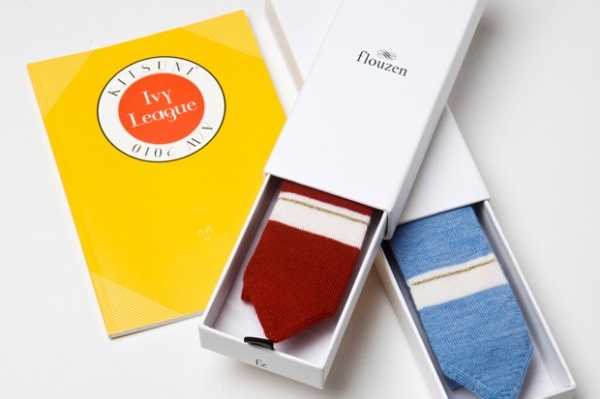 Expected to be available soon for Fall 2010, these beautifully crafted fox tail ties will come in six different models, each representing a different Ivy League University. Stay tuned for pricing and availability. This entry was posted in Ties and tagged Ivy League, Ivy League University, Kitsune Creative Director Masaya Kuroki. Bookmark the permalink.